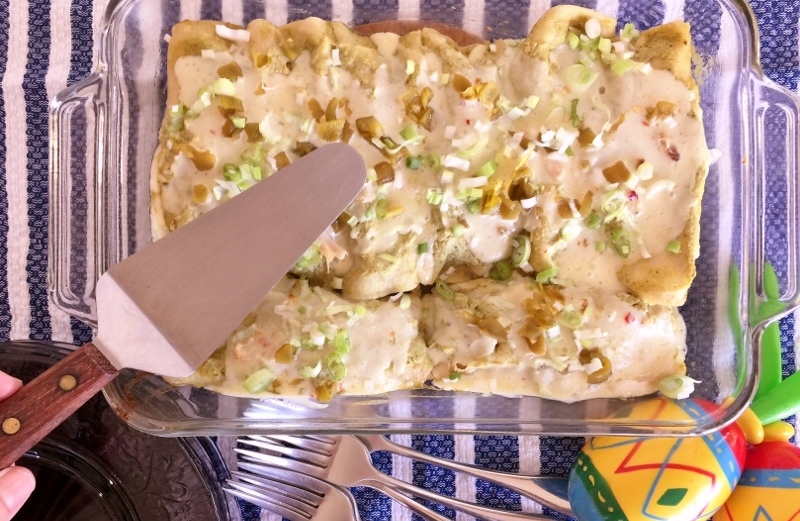 Chicken Enchiladas Verdes - Recipe! - Live. Love. Laugh. Food. Enchiladas, corn tortillas filled with cheese, meat and many times vegetables, are most often topped with red chili sauce and baked in the oven. Enchilada sauces can be made with a variety of different chilies like; Ancho, New Mexico or Guajillo, however sometimes they are prepared with Mole’ or Salsa Verde (Tomatillo) sauce, which offers a much different Mexican food experience. Mexican food was a big part of my upbringing in Anaheim, which has a large Hispanic population and it’s where my love of Mexican food and culture began. Our family often dined at local Mexican restaurants and I learned to make tamales from a local Hispanic women at a young age because of my curiosity for Mexican hand-crafted food. 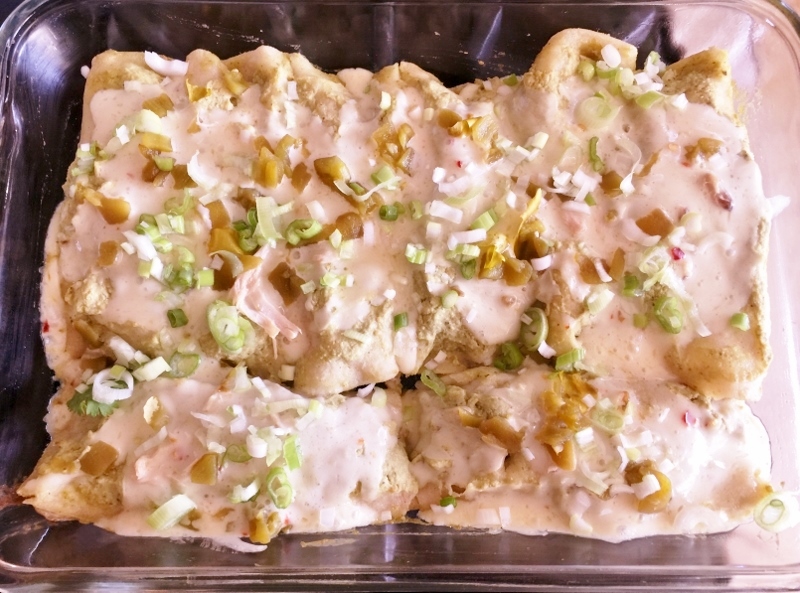 Enchiladas were a dish that me and my family prepared at home for weeknight meals, sometimes using a canned sauce, but as I got older and a little more sophisticated in the kitchen, I discovered dried chilies and how easy it was to make sauce from scratch. The time it takes to soak dried chilies and puree them in a blender is just a matter of minutes, and well worth the effort. 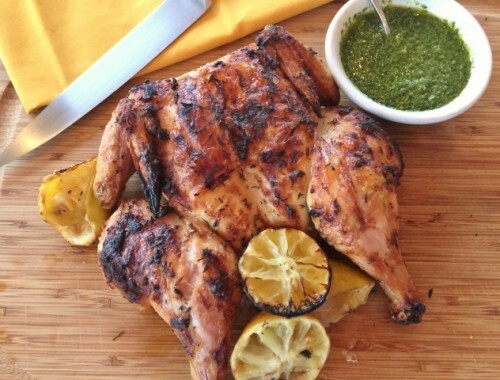 This recipe is an easy combination of store-bought roasted chicken with my homemade Tomatillo Salsa – the salsa recipe is already on my blog. They can be assembled in minutes, especially if you make the salsa ahead, or if time is really tight, you can buy store-bought salsa. 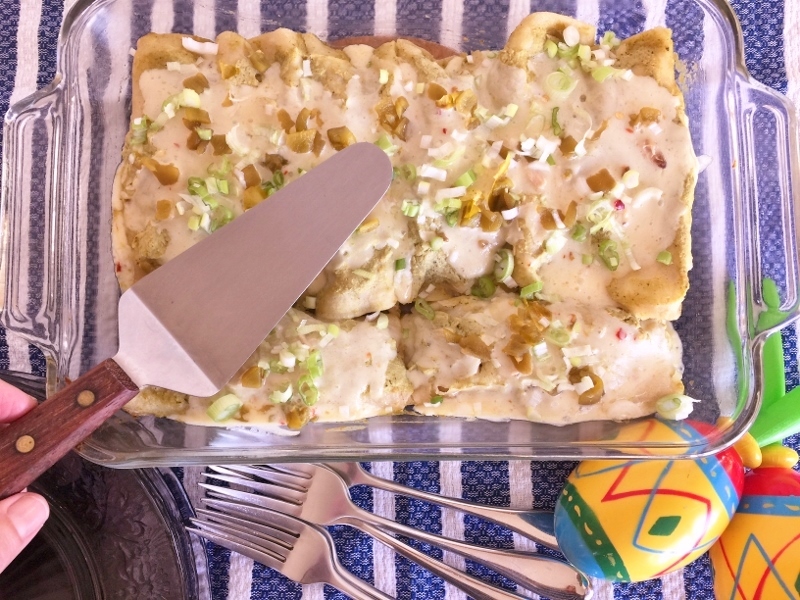 You might want to double the batch of enchiladas and freeze a pan for another meal or a Mexican Fiesta, like Cinco de Mayo just around the corner. 1. Preheat oven to 350 degrees. Remove skin and bones from chicken and shred, set aside. Shred cheese and remove green chilies from can. 2. 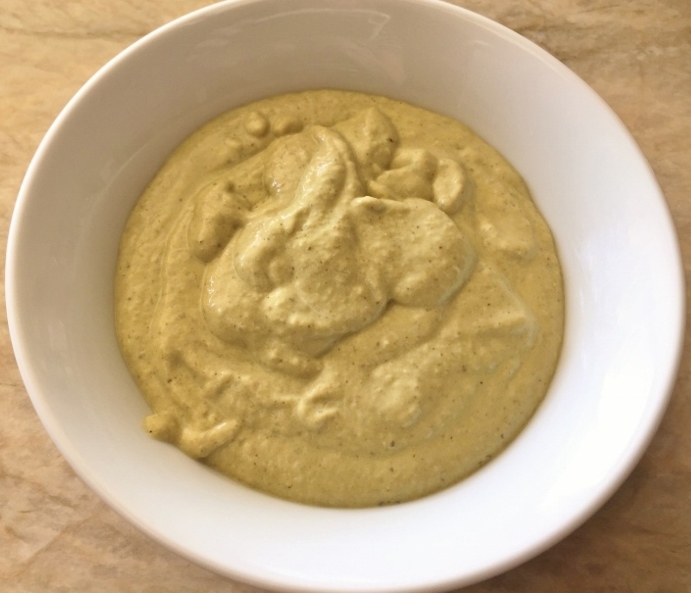 Add Tomatillo salsa to a blender, along with sour cream. Puree for 1 minute, until smooth. Pour into a bowl and add 1/4 cup water and stir. 3. In a skillet, add 1/4 cup vegetable oil and place over medium high heat. 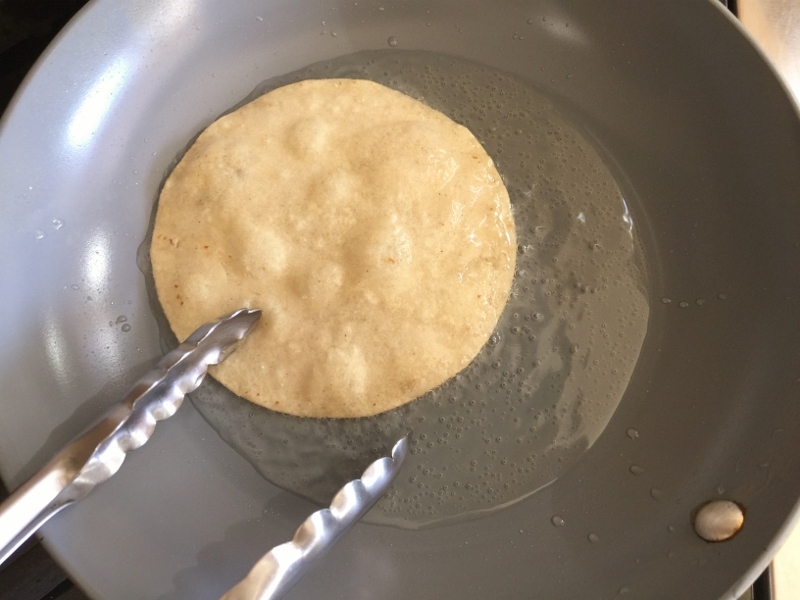 After 2 minutes, add a tortilla and cook for 20 seconds on each side, place on a paper towel lined plate. Repeat with other tortillas. 4. Dip each tortilla into sauce and place in a well greased casserole dish. 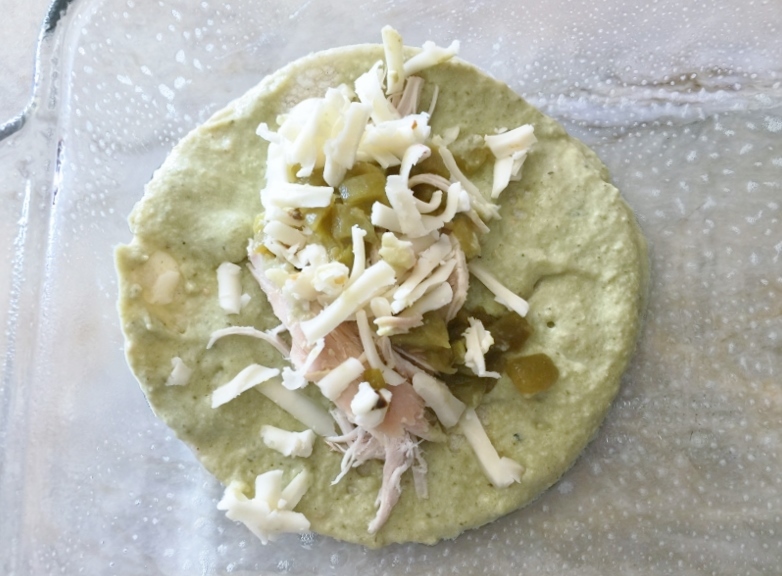 Fill tortilla with 2 tablespoons of chicken and cheese and 1 teaspoon of green chilies. Roll up and place seam side down in dish. Repeat until all tortillas are filled. Spoon rest of sauce over enchiladas and sprinkle with remaining cheese and chilies. Cover dish with foil. 5. 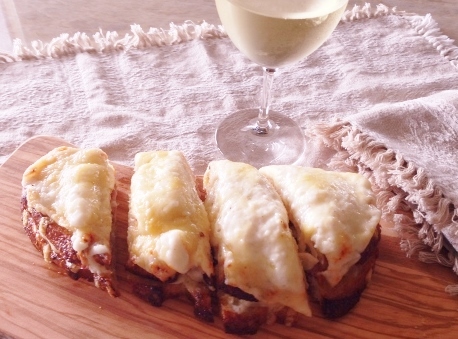 Bake for 20-25 minutes or until enchiladas are heated through and cheese is melted. Remove from oven and top with sliced scallion. 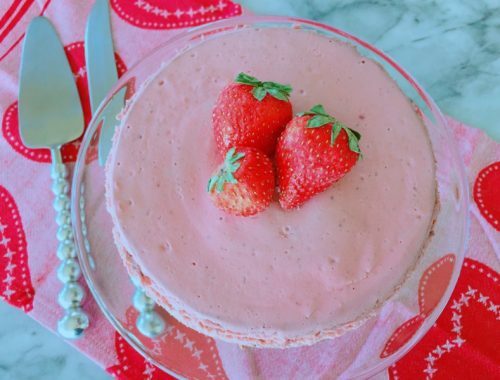 Serve immediately, Enjoy!